NICOLE RICHIE NEWS: Harlow Madden attends Cruz Beckham's birthday bash + Nicole & Joel have a date lunch! Harlow Madden attends Cruz Beckham's birthday bash + Nicole & Joel have a date lunch! 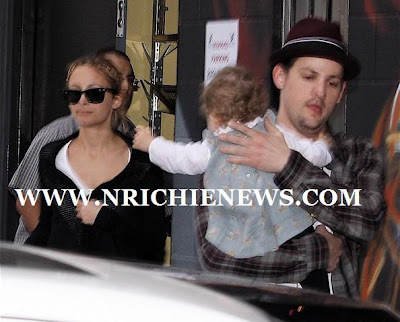 Yesterday afternoon (21st Feb) Nicole Richie and Joel Madden were pictured taking their daughter Harlow Winter Kate Madden to Cruz Beckhams birthday party at the Xtreme martial arts world headquarters. Later on that afternoon Nicole and Joel were spotted heading to Hugo's restaurant.. The couple were looking super cute together!! I am loving Nicole Richie outfit, it is almost a summer look & i love Nicole Richie's summer wardrobe! Nicole was wearing a pair of Abercrombie & Fitch 'Nicolette light destroy' denim cut off shorts, matched with a James Pearce casual white 'tee, a black drape back cardigan she then dressed the outfit up with a pair of Balenciaga peep toe booties and wore a pair of Chloe 2123 sunglasses! Are you loving Nicole Richie's look! ?